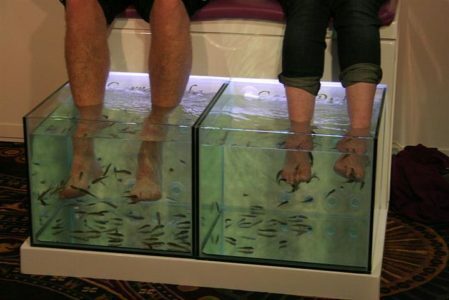 Garra rufa fish are often starved to encourage them to give so-called “fish pedicures.” Within the beauty industry, these fish are regularly exposed to poor water conditions, high stocking densities and unsafe chemicals. Take action now to put a stop to their suffering. Garra rufa are used in spas for “fish pedicures” where they eat the dead skin from a client’s feet in an attempt to soften and smooth the skin. The stocking density of spa tanks is usually 60 to 100 fish per 100 litres which is much higher than what the fish would experience in the wild and can lead to poor water quality, including ammonia build-up. The fish will often jump from the tanks if left uncovered in an attempt to escape these conditions. High stocking densities can also increase the spread of ectoparasites between fish. Garra rufa only exhibit skin eating behaviour when food is scarce so, to encourage the fish to give these pedicures, they are often underfed or, in some cases, outright starved. The fish are also unable to engage in other normal behaviours as the tanks provide no enrichment or hiding places where they may rest between clients, causing unnecessary stress. Also, once the feet are submerged, the fish may be exposed to toxic chemicals from any toiletries, nail polish or cleaning chemicals on the client’s feet. Not only are fish pedicures bad for the fish but they’re also unhygienic for the person receiving the treatment since it’s difficult to stop infections from being spread from customer to customer through the fish. In very rare cases, infections can even spread from fish to person, specifically mycobacteriosis which causes a condition known as fish tank granuloma in humans and is difficult to treat. Several US states and parts of Canada have already banned fish spas due to them being unsanitary, but we need more places to follow in their footsteps. Sign the petition now to end the unnecessary suffering to Garra rufa.